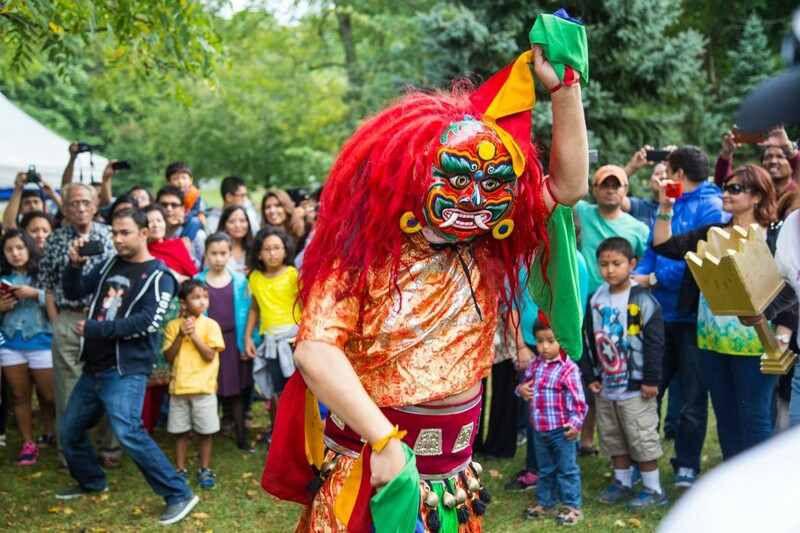 On Saturday, September 13, 2014, large number of community members friends & family celebrate the fourth annual Yenya Punhi (Indra Jatra) festival organize by the Newah Organization of America in Maryland. NOA continued the event tradition with authentic Newah food, a pyramid-style Samay Baji display with many different traditional indigenous items, the Lakhey (demon) Dance, the Pulukisi (white elephant) Dance, and a beautiful traditional local Kumari. In spite of the early morning rainy day all the attendees enjoyed meeting friends and family as of Kathmandu valley tradition. NOA is proud to bring the community together to preserve our culture alive in the US. 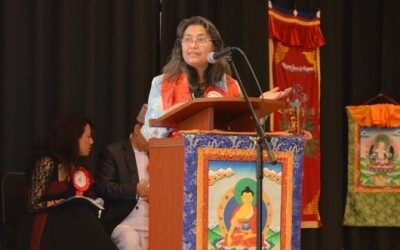 Beside DC metro area, we have participant from all over Boston, New york, Pennsylvania, Mississippi, Colorado just to experience this year Yenyan Punhi (Indra Jatra) celebration.At the scenic Black Hill Regional Park in Maryland crowds gathered from noon to five o’clock evening were entertained various cultural presentation such as a Kumari by Miss Prisha Shrestha, as a Lakhe by Mr. Yagya Man Shakya, a performance of traditional instrument Dhimay and Bhusya by Mr. Pushkar Prajapati and Mr. Divakar Dhaubhadel and as a Pulukisi attendee Mr. Sushil Lal Shrestha and Mr. Mahindra Pradhan.Authentic Newah dish on a pyramid-style Samay Baji were displayed on the occasion, which was completed by Mr. Divakar Dhaubadel. Respected Newah Priest Mr. Basav Rajopadhyay explained about the Yenya Punhi (Indra Jatra) including brief of Dagni, Mata Biye and its importance in our life. NOA President Mr. Ram Lal Shrestha welcomed representative from Nepalese Embassy Mr. Narayan Mainali with all attendees and thanked the generous community members who donated financial and food contributors, the dedicated executive committee and their families, the loyal NOA founding members, and all the enthusiastic attendees. He also expressed special thanks to Past President Mr.Rajesh Shrestha and his family for building the life-sized Pulukisi for NOA, Past President Mr. Season Shrestha for initial help to bing Dhimey and Bhusaya, Mr. Mahindra Pradhan for the coordinating Food & Beverage, Mrs. Babita Shrestha, Mr. Madan Shrestha, & Mr. Sushil Lal Shrestha for the store and transport of Pulukisi, Mrs. Krishna Pradhan & Mr. Yagya Man Shakya for presentation of the Kumari Display, Airzone Travel of Mr. Rajesh Lal Shrestha for sponsoring NOA T-shirts 2014, Aero Nepal Travel of Mr. Rakesh Tuladhar for the brochure and Mr. Rajesh Lal Shrestha and Kiran Ranjit for coordinating the venue. Mr. Shrestha also welcome Executive Committee representative from Newah Organization of New England (Boston) Mr. Kumar Sindurakar, Samanta Bajracharya, Niraj Shrestha and their family. During the same occasion, the famous Nepali poet “Janakavi” (People’s Poet) Mr. Durga Lal Shrestha’s new book “The Blossoms of Sixty Four Sunsets” has been jointly launched by NOA 1st past president Mr. Beda Pradhan, the Embassy of Nepal’s Counselor Mr. Narayan Prasad Mainali, and Mrs. Nancy Chhetri (UN Peace Corp -1970, volunteer teacher at Sanothimi School, Bhaktapur). This is a dual-language (Nepal Bhasa/English) collection of poems that has been translated into English by poet-linguist David Hargreaves. Janakavi Mr. Durga Lal Shrestha sent a Vintuna-best wishes audio message also broadcast in to the public. 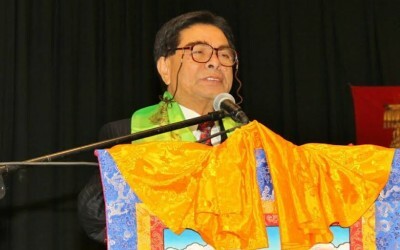 Embassy of Nepal’s Counselor Mr. Narayan Prasad Mainali praised to NOA for promoting and keeping alive the Newah Nepalese traditions in the United State. Mr. Kumar Sindurkar representing Newah Organization of New England (Boston) also exchange a Vintuna on this occasion and promise to keep alive Newah tradition in New England region. Mr. Pushkar Prajapati, master of ceremonies, closed special talk session. The large crowed enjoyed Local Kumari blessing and the Lakhey and Pulukisi performance at the park also children enjoyed recreational games along with delight while running away from the Lakhey and Pulukisi. The Yenya Punhi celebration was very festive, and NOA extended sincere thanks to all who stretched well into the day and ended with a lot of wonderful new memories. Please visit NOA’s website at www.newah.org or find us on Facebook or on YouTube to see photos and videos of the great event.